After conducting days of research and testing an assortment of nine different backpacks, duffels, totes and briefcase-style bags, we think that the Tom Bihn Western Flyer (available at Tom Bihn for $240.00) is the best personal-sized carry-on bag you’ll find. Looking for other options? We've also tested checked luggage and carry-on luggage. Constructed from either 1050 Ballistic Nylon or lightweight 400 Halcyon fabric and available in an assortment of colors, the Tom Bihn Western Flyer will fit under an airline seat with room to spare—a fact you’ll appreciate when you stretch out on your next cross-country flight. Its exterior front panel contains a stowaway water bottle holder and two large, zippered pockets: one which provides ample space for your car keys, passport, and other small essentials. The second pocket is large enough to store an eReader, 8” tablet, smartphone or paperback novel to read on your flight. With 26 liters of interior space, the Western Flyer is large enough to use as a small suitcase for a weekend getaway with room to spare for a laptop, snacks, and magazines. Its interior space is broken down into two large compartments: The first contains a fabric partition to help you stay organized, when needed, or zipped out of the way to allow for one large chunk of space that’s ideal for a laptop. The second pocket proved large enough during testing to contain a complete change of clothing, or if you prefer, multiple pairs of underwear, socks and a couple of dress shirts. In addition to all of this, the Western Flyer is incredibly versatile. It can be carried by its built-in handle like a briefcase, be paired with a shoulder strap (sold separately,) or worn like a rucksack, thanks to a pair of backpack straps that stow away when not in use. What’s more, thanks Tom Bihn’s selection of packing cubes, padded electronics cases and their organization Freudian Slip insert, this bag can be customized to please most any traveler. The GoRuck GR1 was designed by an ex-Green Beret to be as at-home in combat as it is on a city commute. Made from tough, water resistant 1000 denier CORDURA, the 21-liter version of the GR1 easily fit into our bag sizer during testing. The 26-liter version of the pack? Not so much: Be sure to select the right size when you place your order. The GR1’s shoulder straps sport generous padding, making it ideal for carrying heavy loads. In the back of the bag, you’ll find a hidden compartment that can securely carry laptops up to 15 inches. In less urban environments, the compartment, which comes complete with a pass-through for a hydration hose, can also be used to tote around a water bladder. Its front panel comes with a zippered slash pocket that’s great for stuffing sunglasses, travel documents or a smartphone into. By unzipping the GR1’s large main compartment, you’ll gain access to two ample, zippered pockets built into the rucksack’s lid and a large pocket in the back of the compartment that’s perfect for stuffing documents or a tablet into. The bag opens flat, making it easy to pack, and easily contained all of the items on our test list. As it comes with multiple MOLLE webbing attachment points, it’s possible to add or remove pockets for extra storage, as needed. I’ve been relying on the GR1 as my go-to backpack for travel, jaunts to the coffee shop and ill-advised excursions for years. 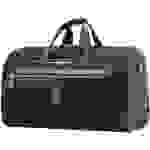 If you’re hard on your belongings or travel to ill-advised locales where things could very quickly go very wrong, this is the personal-sized carry-on bag for you. 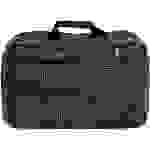 It’d be easy to mistake the Never Check Overnight Briefcase for a laptop bag. While it’ll definitely haul a computer around for you, this relatively inexpensive personal carry-on bag can be used for so much more. This bag boasts two zippered pockets sewn into its front panel: one sized for small items like a smartphone or passport and a larger compartment with a zippered mesh pocket, pen holders, and organizational dividers sewn into it— it’s the perfect size for storing snacks or a tablet like an iPad or Surface Go. The back of the briefcase is home to a padded laptop compartment and an exterior pocket that can be unzipped and used as a passthrough for sliding the bag over the retractable handle of a suitcase. Its 22-liter interior main compartment was able to hold all of the clothing and toiletries on our test list and kept them organized with sewn-in organizational pockets and a vanity shield. 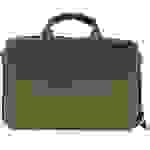 That said, the briefcase’s shoulder strap and handle have no padding, making it uncomfortable to carry at times. 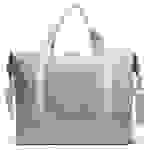 Additionally, its zipper pulls were of a lower quality than any other bag we tested. My name’s Seamus Bellamy. I’m a full-time digital nomad. I live a lot of my life out of a suitcase—I’ve tested a lot of them, too! I’m responsible for Reviewed’s guides to the best carry-on suitcases and best checked luggage. When I’m not flying somewhere for work, I migrate around North America in a 40-foot RV. Travel is in my bones. I love it. I want to make sure that you have the gear you need to love it, too. The only guidelines that most airlines provide for personal carry-on items, aside from sizing devices scattered around airports, is that they must fit under the seat in front of you. That’d be fine if anyone could say how much space there is under an airplane seat. Unfortunately, these dimensions vary by airline, the type of plane you’re in and where you sit. Those in the middle seat of a set of three chairs, in economy, for example, will find they have more under seat space in front of them than those seated on either side of them. Sizes are also different for seats next to the plane’s bulkhead, or in some emergency exit aisles. Seatguru.com keeps track of the maximum size limits for personal carry-on items for most major airlines, but it doesn’t consider things like room to put your feet or things like in-flight entertainment boxes that sometimes reside in those spaces. So, instead of relying on what the airlines and experts have to say, I looked to the maximum allowed sizes for far more precious in-cabin cargo: pets, which FAA regulations state must be in containers small enough to fit underneath the seat in front of you without blocking the main aisle of the airplane. Since different airlines suggest different dimensions, we decided to call into testing bags that were slightly smaller than the largest pet carrier allowance (11” x 18” x 11” from United Airlines). We also wanted the bags to be soft-sided, like a duffel bag, purse, or backpack, so they would be easy to stuff under a seat. To ensure size compliance for all the bags we tested, I built a bag sizer similar to what you’ll find at many airports, with 8” x 18” x 14” dimensions. I attempted to insert each bag into the sizer, twice. The first attempt was to see if the bag was true to its advertised size. Next, I tried placing them back into the sizer while laden with a number of items that one might want to bring with them on a flight, such as a 13-inch laptop, change of clothing and small toiletry kit, notebooks, pens, a passport, a large pair of Bluetooth headphones, an iPhone 7 Plus, an eReader, and a newspaper. Any bags that were unable to fit in the sizer with or without all of these items were disqualified. I also paid attention to how comfortable the bags were to carry, if it was a chore to pack, its security and accessibility to pockets that could hold important items like keys or passports, the overall build quality, and how useful each bag might before someone headed to school or commuting to work. Price: With suitcases and other carry-on baggage, I advise you to spend more if you travel more. High-end luggage tends to be more durable, so you’ll have to replace it less often. The same can’t always be said for personal carry-on sized bags. Sometimes, as these smaller bags, purses, and backpacks can be used as fashion accessories as part of your daily commute, the price of a bag is commensurate with its brand’s recognition, rather than its durability or utility. Boring is safe: Speaking of brand recognition, play it safe. As you’ll likely be using your personal carry-on to haul your camera, laptop, passport, and other valuables, it’s best to avoid status brands like Tumi, Louis Vuitton and the like as they scream ‘I have money, please help yourself.’ Nothing ruins a trip faster than a mugging or being targeted by pickpockets. Avoid wheels if you can: wheels and a retractable handle for pulling your carry-on along with you will eat into the already limited amount of space bags sized to slip under an airplane seat offer. Avoid them when you can. 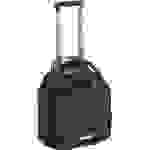 Handles: If the personal carry-on sized bag you want comes with wheels, its retractable handle should slide smoothly and offer at least a couple of height settings to accommodate shorter or taller users. All handles and backpack straps should be well padded to make the bag's weight less of a burden when you have to lift and carry it. Organization: Bags that offer a number of easily accessible exterior pockets for small items like a passport, smartphone and tickets are a smart buy. Look for bags with a large main compartment that can be used with packing cubes, or stuffed full of a number of loose items such as a water bottle, snacks or a hoodie. If you plan on using your bag for work trips or having it double as a tote for your daily commute, be sure that any laptop compartment, tablet sleeve, or admin panels built into it will suit your needs. The AirPorter Carry-On’s rugged exterior grows more handsome with every scuff it’s subjected to. Even so, this carry-on’s 'been through it all' good looks aren't for everyone, limiting its appeal, even when the bag’s alternate color options are taken into consideration. The AirPorter can be hauled around using its comfortable leather and canvas handles or a padded shoulder strap. A magnetically sealed flap on the front of the bag conceals a small zippered pocket perfectly sized for carrying a smartphone, passport and other small valuables. There’s also an open pocket that’s ideal for stashing an iPad. The AirPorter’s laptop compartment is big enough to also be used for a light jacket, while its main compartment has room enough for a change of clothing. Ample sewn in pockets line the interior of the bag. If you like its tough, classic aesthetics, this briefcase is worth your consideration. I included the Eagle Creek Expanse Wheeled Tote in this roundup because not everyone is physically capable of carrying their bag on their back or over their shoulder. The Expanse Wheeled Tote is well built and was able to carry everything on our test list. What’s more, I was surprised by the sturdiness of its retractable handle. Unfortunately, the retractable handle and its wheels take up a lot of the bag’s silhouette and interior space, making it less useful than other bags of a similar size. 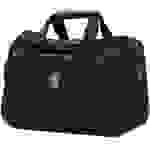 Made from ballistic nylon, trimmed with tough, leather and outfitted with top quality zippers, this is a high-quality personal carry-on bag designed for frequent travelers. I found its well-padded leather handles made carrying it, fully loaded, very comfortable. It fit all of the items on our test list with no issues and is lined with small pockets for organizing small items. It even comes with a removable toiletry kit. However, it’s open interior design could irk some travelers: there’s no dedicated spot to carry a laptop in the Regional Duffel and, if you choose to stow one in this bag, you’ll have to store your clothes around it. Additionally, like any duffel bag, the Regional Duffle is top loading. In order to find an item at the bottom of the bag, you’ll need to either remove everything on top of it or shove it all to the side. This bag would be a great under seat-sized carry-on for someone only interested in filling it with clothes and toiletries, but it’s less than ideal for carrying anything else. Like the more expensive Travel Pro Platinum Elite Carry-on Regional Duffel, the Deluxe Tote is a bag best used by those who only wish to take clothing, snacks, toiletries and small electronic items with them on their flight. The bag’s 24.3 liters of space is broken down into two different compartments. 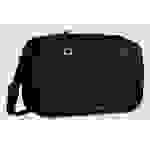 The first, sewn into the outside of the bag, is sized to fit a 10-inch tablet. There’s an admin panel sewn into the back of this compartment for pens and other small items, too. Sadly, as the pockets are open at the top and a little saggy, what you put in them will likely spill out if the bag is tipped. Additionally, while this pocket was able to contain an iPad, its lack of padding didn’t make me feel particularly comfortable leaving it in there. The second, larger compartment, proved capable of holding all of the items on our test list. A zippered mesh pocket built into this compartment was a good fit for stashing small items like toiletries, power adapters or socks in. Unfortunately, as the bag has no laptop compartment, my 13-inch laptop had no padding to protect it from bumps or being dropped. Finally, just as with Platinum Elite Carry-on Regional Duffel, having a laptop in this bag makes it difficult to pack clothing into it. I’d hoped that the Catalina Deluxe Weekender Bag’s ample 18" x 24" 16" would fit into our sizer—after all, it’s a tote: a bag that’s easy to scrunch down. Unfortunately, this was not the case. That said, if you’re looking for a bag that will hold, as its name suggests, a weekend’s worth of clothing, toiletries and comes with a separate compartment in its base for hauling along an extra pair of shoes, it’s your huckleberry. What’s more, it’s tough build quality and industrial grade zippers will ensure that this tote will serve you well for years to come.